Potential clients reach out to me on a fairly regular basis. I would say I receive 2 - 3 messages or e-mails a week asking for session info or wanting to put something on the calendar. For a full time working mama who owns this amazing photography business on the side, I do my best to keep up with them all. ONE PARTICULAR SATURDAY EVENING THOUGH, I RECEIVED A MESSAGE WITH A REQUEST THAT SIMULTANEOUSLY MOVED ME TO TEARS AND ROCKED MY SOUL. About a month ago, a notification popped up that I had received a message on my Facebook business page from Amber. Her words were filled with warmth and kindness, telling me how much she loved my style and had been wanting to book a session with me for some time now. After a few sentences though, the intention for this specific message became clear — Amber found herself suddenly facing a rare form of cancer and was starting chemo that following week. She spoke of being inspired by a “Warrior Makeover” session she found on a blog. She wanted to chop off her hair before she lost it to chemo, to be able to take ownership, feel beautiful, and truly embrace this process. She also asked if I would be open to photographing this special makeover session. My heart nearly burst and I replied with a resounding “YES!”. I swear, if you could hug someone through messenger, I would have given her the most love filled hug right then and there. 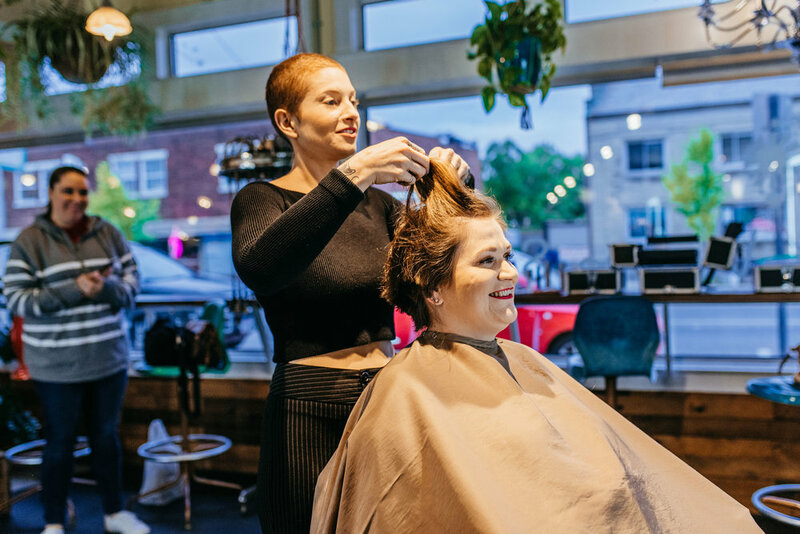 We collaborated on all of the details and settled on reaching out to an incredible salon in Clintonville (within Columbus, Ohio) called Virtue Salon. They use natural, vegan-friendly products, and their makeup and hairstylists are insanely talented. We locked the plans into place and awaited the transformational day. The official day came, and we were greeted by the incredible Allison, a stylist at the salon. If you’ve never been to Virtue, check out this space — this place is filled to the brim with warmth, acceptance, empowerment, and beauty. 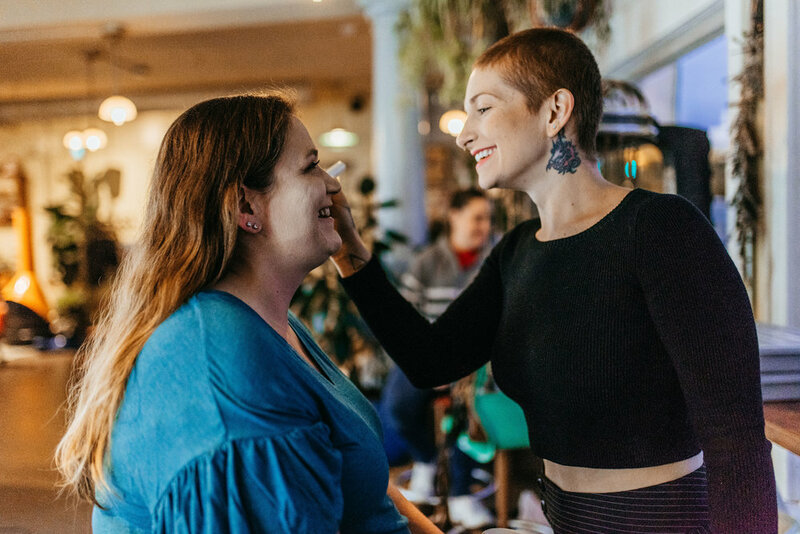 As was Allison, and she encouraged Amber to embrace this change and feel beautiful in the process. I’m going to let the images tell the rest of the story, but the energy in this room as the process unfolded was unreal. Amber, thank you for trusting me with such a vunerable moment in your life. I am cheering you on from the sidelines to fight and beat this cancer. You’ve got this girl. Alisha Skeel of Alisha Skeel Photography is a Documentary Family Photographer based out of Westerville, Ohio specializing in photographing families with children in a natural and authentic way. Alisha is also a working mom and wife who believes deeply in human rights and equality, social justice, and the importance of utilizing photography to celebrate all walks of life. Alisha Skeel is available to hire in the greater Columbus, Ohio area as a Documentary Family Photographer, LGBTQA+ Photographer, Adoption Photographer, Personal Branding Photographer, Small Business Photographer, Columbus Startup Photographer, Family Vacation Photographer, Special Events Photographer, In-Home Photographer, Lifestyle Newborn Photographer, Pet Photographer, and Lifestyle Photographer. Alisha Skeel Photography is available to travel for photoshoots and offers photography mentorship. Please submit the contact form for more information.